Last week, White House press secretary Sarah Huckabee Sanders described a new book by prominent US journalist Bob Woodward as "nothing more than fabricated stories, many by former disgruntled employees, told to make the president look bad." Sputnik looks into some key excerpts from "Fear: Trump in White House." In his recently-released book about US President Donald Trump, veteran Washington Post journalist Bob Woodward focused on a whole array of pressing international issues, including those related to the US military's missile strikes on the Syrian military airfield in Ash Sha'irat in April 2017. According to Woodward, Trump allegedly considered giving an order to launch "a secret blow" against Syrian President Bashar Assad after the Sha'irat missile attack, insisting that the US should do more. At the same time, Woodward claimed, US Secretary of Defense James Mattis was allegedly alarmed about the idea of launching a second strike on the Syrian airbase at the time, which is why he worked to dissuade the president from pursuing the military operation. In the long run, Trump stopped demanding the second missile strike on Syria and gradually got down to other issues, Woodward wrote. In his book, Woodward also alleges without elaborating that Russia once warned Pentagon chief James Mattis that if NATO uses military force against Russia in the Baltics, Moscow will not hesitate to use tactical nuclear weapons against the alliance. The alleged warning prompted Mattis to start saying that Russia poses an existential threat to the United States, in a move that was endorsed by the Chairman of the US Joint Chiefs of Staff, General Joseph Dunford, according to Woodward. Separately, Woodward describes how the US President's entourage, including Mattis and Dunford, allegedly tried to convince Trump of the need to preserve NATO during an informal gathering at the White House on February 8, 2017. In this context, Woodward cited Mattis as allegedly saying that if NATO did not exist, it should have been invented. The US Defense Secretary also alleged at the time that Russia will never be able to win the war if it ever challenges NATO. In another part of his book, Woodward touches upon the US President's advisor Jared Kushner's alleged attempts to bring the American-Saudi relationship back to the focus of US foreign policy. According to the author, Kushner discussed the issue with Derek Harvey, a retired military colonel who was in charge of Middle East policy at the National Security Council during Trump's first year as president. The two officials allegedly called for holding a major summit in Saudi Arabia during Trump’s visit to the kingdom in 2017, with Kushner then inviting Saudi Crown Prince Mohammed bin Salman Mohammed bin Salman. According to Woodward, Salman's visit took place in March 2017, two months ahead of Trump's trip to the Middle East. 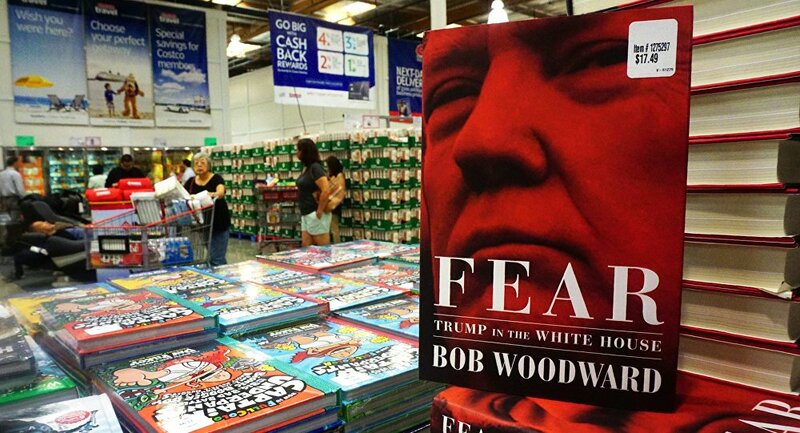 Last week, Trump tweeted that Woodward's new book is nothing but a "scam, which has already been refuted and discredited by General (Secretary of Defense) James Mattis and General (Chief of Staff) John Kelly." He was echoed by White House press secretary Sarah Huckabee Sanders, who slammed the book as "nothing more than fabricated stories […] told to make the president look bad."